A composite image of the 2009 total solar eclipse based on dozens of images taken at Tianhuangping, China, by Jay Pasachoff, Sara Dwyer '11, and Rachel Wagner-Kaiser (Keck Northeast Astronomy Consortium Summer Fellow, Vassar '10) and computer-processed by Wendy Carlos. 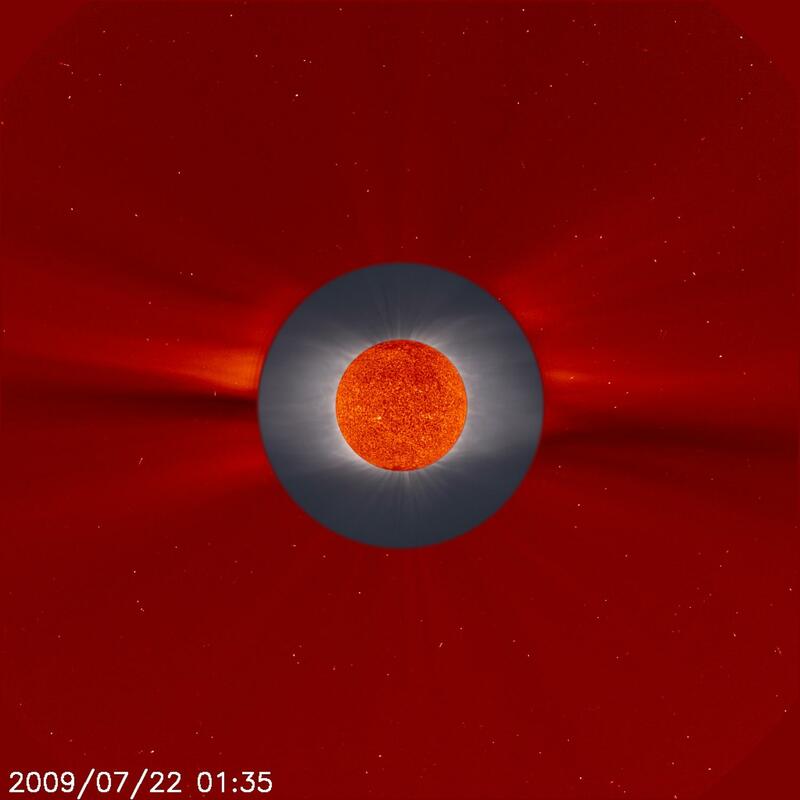 A total solar eclipse image from Tianhuangping, China (outside Hangzhou at 900 m altitude) during the 22 July 2009 eclipse, merged with a SOHO Extreme- ultraviolet Imaging Telescope (EIT) disk image in the helium 304 Å emission line and a Large-Angle Spectrometric Coronagraph (LASCO) image of the outer corona. The corona was very sparse because of the exceedingly low phase of the sunspot cycle, really a cycle in the solar magnetic field known as the solar-activity cycle. Williams College Eclipse Expedition: Jay M. Pasachoff, Bryce A. Babcock, Katherine DuPré, Sara Dwyer, Rachel Wagner-Kaiser, Yung Hsien Ng Tam, Huajie Cao; EIT image courtesy EIT Team, NASA's Goddard Space Flight Center; LASCO image courtesy of LASCO Team, Naval Research Laboratory; compositing by Steele Hill, NASA's Goddard Space Flight Center; eclipse image processed by Wendy Carlos out of many individual images in order to bring out coronal detail. Pasachoff article in the journal Research in Astronomy and Astrophysics, volume 9, number 6, pp. 613-634, May 2009 issue. 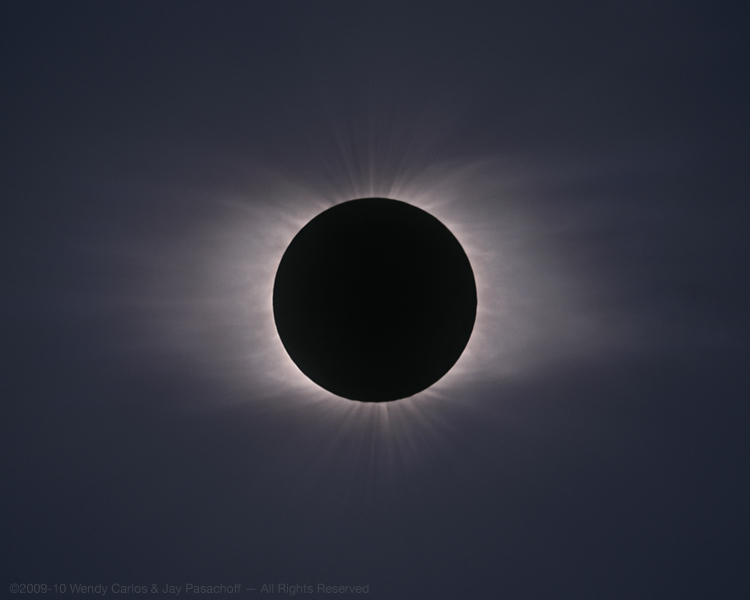 "Scientific observations at total solar eclipses"
Pasachoff review article on eclipses for the International Year of Astronomy's coverage in Nature, issue, Nature, volume 459, pp. 789-795, June 11, 2009. "Solar eclipses as an astrophysical laboratory"